If you were at the grocery store and you saw an elderly person that had fallen, what would you do? Would you run over to help them? Would you alert a store employee? Or would you just walk by, because you have lots of shopping to do? What if you were driving down the road and you saw an accident? Would you stop to help? Would you call 911? Or would you just drive by, because you don’t want to get involved? What if you saw a man lying in a ditch on the side of the road? Would you stop to help? Or simply say a little prayer as you passed by? Or would you be too afraid to get close enough to see if he was okay? Folks, sometimes it’s hard to make a decision about whom to help especially in today’s society. Many times, we worry about getting sued, or being taken advantage of, or simply getting hurt ourselves. But let’s think back to the story of the Good Samaritan for just a minute. Here we have a man, robbed, beaten, and left in a ditch to die. Then, two separate people came along and see the man in the ditch. First, a priest saw him and carefully avoided him on the opposite side of the road. Then a Levite saw him and also passed by. Now, in their defense, I have to say that the priest and the Levite were only doing what their heads told them was right. After all, in their culture, a person who was bleeding was considered unclean. It would have been a very serious thing for either of them to have touched this hurt man, and they would have had to touch him in order to help him, right? So, they weren’t really being insensitive by passing him by. They were simply avoiding all the inconveniences in their lives, like the inconvenience of the days and days of ceremonial cleansing that they would have had to go through if they had touched the wounded man. They were using their heads and thinking more of their own needs than the needs of the man in the ditch. Okay well back to the story. The third person that came by was a Samaritan. The Samaritan actually had more reasons to avoid the man in the ditch. Not only was the wounded man bleeding, and therefore unclean, but he was also a Jew. Back in Jesus’ day, Jews and Samaritans had been enemies for a long time due to religious differences. Under normal circumstances, Samaritans and Jews would not even talk to each other. And yet, this Samaritan, whom the Jew would have considered an enemy, looked beyond the judgment in his head and followed his heart, reaching out with love and mercy and compassion to this total stranger. The scripture ends with Jesus telling us that the true neighbor was the one that showed mercy. After all, the greatest commandment of all tells us to love God and to love our neighbor as ourselves. Now folks, in order to love our neighbor as ourselves, we have to follow our hearts and share a piece our own self, whether that be time, effort, energy, or compassion. That can be hard to do. And now that we know we need to love our neighbor, we must ask, “Who is our neighbor?” We sometimes know the people who live next door to us, or other people in the pews around us, and our heads tell us that they might be “safe” to help. But what about the elderly woman you meet at the grocery store who needs help reaching a can on a high shelf? Or the teenage girl whose car has broken down on the highway? What about the kid with the blue hair who hangs out with the “wrong” crowd? Or the motorcycle rider who is covered with tattoos? What about the homeless man at the train station? Or the Jehovah’s Witness that rings your doorbell? It is very easy to draw lines that divide “us” from “them,” especially if we feel threatened. We look at our neighbor and instead of loving them, we first judge them. We look at their appearance, and we sometimes check their Facebook page, and depending on their age, their clothing, the language they speak, the color of their skin, their sexual orientation, their political stance, their social class, their religious affiliation, or even the team that they are rooting for in the Super Bowl, we judge them, whether we know that we are doing it or not. But many times, my friends, looks can be deceiving. It is easy to look at another person and make a quick judgment based on the way they are dressed or how they act, but that is a result of our heads leading us again. We forget that behind all of those labels and descriptions is simply a child of God. It’s interesting; I often get comments about our church and about the funeral services that I officiate, and the word that people often use is “real”—that what we do in and from Oldtown feels “real.” We don’t use fancy church language or empty phrases. Instead, we meet people where they are, and we allow our faith to take us to where the rubber hits the road. Now I have to be honest, when someone says that to me, my heart overflows, because I feel like we’re doing things the right way. But the problem is, as soon I start thinking we’re doing it “right,” it feels like that means that someone else must be doing it “wrong.” And them, without even knowing it, I start to judge those around me. So here’s the big question of the day: if we’re going to be real about our faith, and we are going to follow in Jesus’ footsteps, then what are we called to do? Today, we heard the story of the “Good Samaritan,” and Scripture tells us that above everything else, we are called to love God and to love our neighbor as ourselves. Now, we may think that our neighbors are those who live in the houses next door to us, but Jesus taught that some of our neighbors don’t live next door. Some of our neighbors don’t look like the people who live on our block. Some of our neighbors don’t even own homes, or rent homes, or even have consistent shelter from night to night. Even still, these are surely our neighbors. Folks, when we love God, truly love God with all our heart and mind and soul and strength, God transforms every stranger into a neighbor of ours. The great commandments that Jesus taught from Hebrew scripture tied our love of God to our love of others. How we treat our neighbors, all of our neighbors, reflects our relationship with God. These concepts were all well understood among the Jews of Jesus’ day, but Jesus took them one step farther. Jesus cut through the cultural boundaries of race and religion that divided communities and peoples. He taught that all people are our neighbors. The Good Samaritan story revolves around the idea of neighbor, but what it is really about is love. It’s about what it means to love in the spirit of God, who sent his Son to die on a cross for us. It’s about what it means to love in the spirit of Jesus Christ, who when he was nailed to the cross, said, “Father, forgive them; they know not what they do.” Friends, if we are going to strive to be like Jesus, we have to start judging a whole lot less and loving a whole lot more! On this Super Bowl Sunday I think I would be remiss if I didn’t quote St. Thomas. St. Thomas Brady, that is. I know that some of you are rolling your eyes right now, because, “What does football have to do with having real faith?” After all, football is all about entertainment, and controversy, and drama, and a few individuals who are paid far too much money. But friends, I saw a clip on television this week, and you may have seen it too. It could have been a football player from any team, or an actor or an actress, a model or a singer, but it happened to be a clip of Tom Brady. He was being interviewed by a young boy who was obviously a Patriots’ fan. And he asked Tom, “What do you do with all the haters?” Without a moment’s pause, Tom smiled at the young boy and said, “You love them. You never hate anyone. You just love them.” The word is right there in front of us, my friends, and it is written on our hearts. If we are to have the heart of Jesus Christ, if we are to be the hands and feet of Jesus in this world, then the world is our neighbor. And in the words of Tom Brady, we’re just called to love them, all of them! So, friends, if we’re going to make faith real and allow it to be where the rubber hits the road, then what do we do about the haters in our lives? You know, the people that post upsetting political comments on Facebook, or fight for things we don’t agree with? What do we do with people who tell us how much greater their church is, or their kids are, and who flaunt their successes trying to make us feel small? 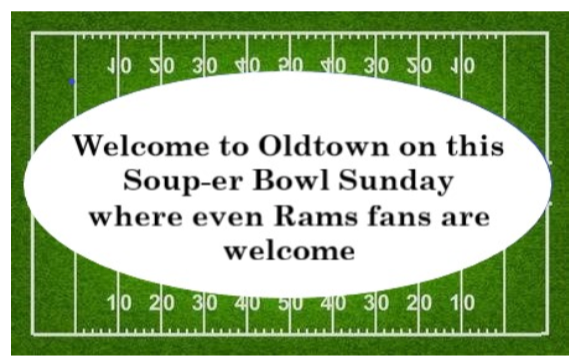 And, on this Super Bowl Sunday, what do we do with Rams’ fans? We Just Love Them! So, Brothers and Sisters in Christ, as you go out into your busy week ahead, I urge you to judge less and to love more. Follow your heart, and let it lead you to loving God and loving your neighbors, all of them!